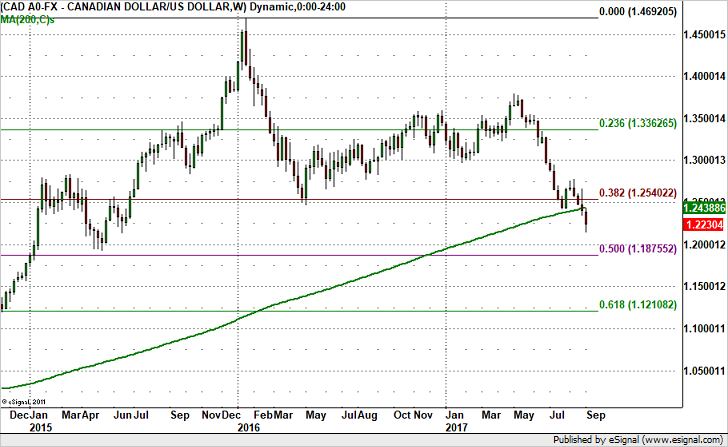 USD/CAD – 1.20 or 1.25? The Bank of Canada caught everyone by surprise when they raised interest rates to 1% today. We knew there was a small chance of a hike but we didn’t really expect it to happen so quickly after the last one especially at a meeting with no press conference. But perhaps that was exactly what the BoC wanted, which is to tighten and then stay mum until they see how the markets and the economy absorbs the move. They may have also felt that they could not wait any longer with the economy running on all cylinders. The BoC did not provide much explanation outside of saying that removal of some of their considerable stimulus is warranted with growth becoming more broad based and self sustaining as business investment and exports strengthened. Their comment about excess labor capacity and subdued wage pressure along with geopolitical risks, trade uncertainties and a stronger currency suggests to us that this could be the BoC’s last rate hike of the year. As they said in the monetary policy statement, future decisions are not predetermined and they have to pay close attention to the economy’s sensitivity to higher rates. So fundamentally while USD/CAD tanked today after the central bank’s rate hike, we would not be surprised to see a near term bottom as the big event has now passed, giving investors a reason to cover their short positions. Technically however today’s move has taken USD/CAD below the 200-week SMA and the 38.2% Fibonacci retracement of the November 2007 and January 2016 rally. So while we could see a further near term recovery that takes USD/CAD to 1.23, any move beyond that may be limited. ← AUDCAD – Pop to Parity?